Bob Stanley was a dependable relief pitcher for the Red Sox in a career that lasted more than a dozen years (AP Photo). Bob Stanley, the Buffalo Bisons’ pitching coach, was part of a nearly extinct species during his playing days in major league baseball. When he was asked to pitch, he’d head to the mound – in any role, for as long as was necessary. Stanley had 33 saves out of the bullpen in 1983, and started 20 games in 1987. Who does that now? 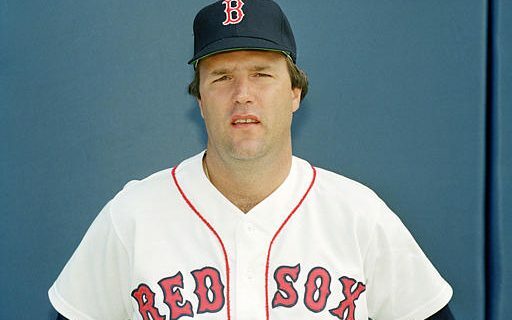 It led to a 13-year career with the Boston Red Sox in the 1970s and 1980s that included two trips to the All-Star Game. He’s a member of the Red Sox Hall of Fame, and holds team records for appearances and relief wins. A baseball lifer, Stanley has been a coach in the minor leagues for more than two decades. Stanley, now 63, still puts in plenty of hours at the ballpark. One sunny afternoon at Coca-Cola Field, he was working with his pitchers in the bullpen about four hours before gametime. Stanley took a break from those duties to chat about his baseball career. Buffalo Sports Page: Baseball writer Bill James described you in an article in 1982 as the “Long Reliever Who Can Actually Pitch.” You handled a variety of roles with the Red Sox. How did that come about? Bob Stanley: I had a rubber arm. Back then, you did whatever they told you to do. It was short, long, middle, start – I was just happy to be there. BSP: Do you think you would have been better sticking to one particular job description? Stanley: I thought I was a better reliever than I was a starter, because I could bounce back. I pitched 168 innings out of the bullpen one year (1982, setting an American League record). I was a one-pitch pitcher. I didn’t throw a lot of breaking balls. When you throw a lot of breaking balls, that’s when your arm gets sore. Mostly, I was a sinker-baller. BSP: There aren’t many long relievers in the majors any more. Instead, teams use more guys that can go one or two innings. But, if a starter gets hurt or shelled early in a game, his team usually is in big trouble. Stanley: It’s a lot different now. When I first came up, we had five guys in the bullpen. Now they’ve got eight. That year I broke the record for most innings pitched, (Tom Burgmeier and Mark Clear) both threw more than 100 innings. It was a lot of innings out of the bullpen. BSP: You played on some good teams in Boston, a city that loves its baseball, and you stayed there. That must have been an ideal situation for you. Stanley: I grew up a Red Sox fan (he was the first player born in Maine to be an All-Star), so it was kind of a dream come true that I pitched for them for my whole career. I probably could have gone somewhere else and made more money, but then I would have had to take my family and ship them out. I didn’t want to do that. The Red Sox were very fair to me salary-wise. I loved the Red Sox. BSP: Plus, when you went to work, you got to be on the same field that Ted Williams and Babe Ruth played on – Fenway Park. Stanley: I got to meet Ted. I played with some great guys – Yaz (Carl Yastrzemski), Fisk, Rice, Evans, Lynn. We had good teams back then. BSP: You played four Hall of Famers in Boston. Are there lessons that you learned playing with those guys that can be passed on to the players here with the Bisons? Stanley: It’s a different game now. I always say to my relievers, “What do you mean, you’re tired?” That’s the way it is now. You can’t pitch a guy three days in a row. You can only pitch them two days in a row, and then they need two days off. I was telling (Buffalo’s Luis) Santos a little while ago that I pitched 10 innings in relief one game, and then two days later I pitched five more. And he’s complaining because he threw 70 pitches two days ago. BSP: Free agency came to baseball in 1977, your rookie year with the Red Sox. At least salaries went up quickly during your career. Stanley: The money got better, but in my first year I made $19,000. I had to sell my car that year (to make ends meet), and I was in the big leagues. Stanley: My son got sick. He had cancer at age 9 – right after I retired. I would have quit anyway. I did have one more year on my contract, but I gave it back. I had to get him better, and he’s better now. He’s 37 years old with two kids. BSP: You returned to baseball in 1997, with the Mets’ organization. Did you miss it? Stanley: I thought when the Mets hired me, someone was playing a practical joke on me after ’86 (when New York defeated Stanley’s Boston team in the World Series). I love it. I am getting a little tired of the travel now. I’m getting older, and the bus trips knock you for a loop. In the big leagues, you get on the charter (plane) and go. Here you get on a bus. BSP: Do you have one or two key principles that you stress to your pitchers now? Stanley: I’m not a real analytics guy. I’m old school. You work on a solid delivery and throwing strikes. These guys know I hate walks. Most of the time (those baserunners) score. Pitch to contact – that’s the main thing to me. If you walk a guy, you don’t know what would have happened. It’s more a case of solid mechanics and throwing strikes. BSP: It’s seems as if every young pitcher that reaches the majors these days can throw 96 miles per hour. Is there still a place for a pitcher who doesn’t throw that hard, but can change speeds and hit his spots? Stanley: The radar gun is the worst thing they ever invented, because now they go by that. I probably never would have gotten drafted if they had gone by that. It’s not how hard you throw; it’s where you put it. I didn’t walk many guys in my career (471 in 1,707 innings). That’s why you have fielders. If you keep throwing balls, the fielders go to sleep and they don’t react to hits. I blame the pitcher a lot for those hits. BSP: You’ve been a coach in the Mets’, Giants’ and Blue Jays’ organization. Do teams have different philosophies for their minor league teams, or is pitching the same everywhere? Stanley: It’s kind of the same game. I don’t change my theory. If a team doesn’t like your theory, they get rid of you. I got fired by the Mets because I didn’t get a couple of guys to the next level. They forget about all the other guys I got to the next level. With the Giants, I just quit. They wanted me to go to low A ball. I didn’t want to do that. It’s probably the same. The game is changing, with spin rates and analytics. They say if you have a high spin rate, you can’t throw a sinker. Well, (Blue Jays pitcher) Aaron Sanchez proved that wrong. He’s got one of the best sinkers in the game, and he has a high spin rate. They call him a freak. But that’s the way the game’s going now. You go with the flow. BSP: Finally, this is your fourth season as the Bisons’ pitching coach, including the last three in a row. That’s unusual in the minor leagues. You must know your way around town pretty well by now. Stanley: I love Buffalo. I live on Ohio Street, right on the water. It’s really nice. Buffalo is an up and coming city. Canalside is really nice. My wife enjoys coming here and walking the dog along the waterfront. I really enjoy it here. I could ask to go to New Hampshire (home of the Blue Jays’ Double-A team) where I live, but I like Triple-A baseball.